Tyler New Media started with a powerful mission to encourage, promote, and equip marriage in the African American community. Armed with passion and backed by technology, the company went from a small personal blog to an international brand. "We were fed up with the pervasive negative images of African American marriage in the media," states Tyler New Media co-founder Lamar Tyler. In 2007, he and his wife started a blog, Black and Married with Kids, to combat negative perceptions and promote marriage within the African American community. The site is now the largest independent African American marriage and parenting site on the web, with more than 30 regular staff writers. Among its many accolades and accomplishments, Black and Married with Kids has been named one of the Must Read Blogs by Parenting Magazine and was one of Babble's Top Mom Blogs two years running. Ronnie and Lamar were also named one of Ebony Magazine's Power 100. Success did not come overnight. The Tylers' long journey began in online media, but they have worked hard to expand their portfolio—which now includes documentary films, e-books, and audiobooks. They also organize workshops and other events worldwide. At first, explains Lamar, "we were using a hodgepodge of systems that were all independent of each other." Tyler New Media used an online payment system for its website, and sold products on a third-party site that did not allow them to access customers' email addresses. Two more systems were used for event marketing and email marketing, with no communication between them. In addition to multi-system chaos, Tyler New Media was struggling to connect with prospects in a meaningful way. "We were just sending random blog posts via email," Lamar explains. The company was not able to target leads based on their pain points or offer specific products and services as solutions to those issues. With an email list of 9,000 contacts and growing, Tyler New Media had outgrown its hodgepodge of systems and one-size-fits-all marketing strategy. "We had a massive, growing audience and a huge social media presence with no consistent way to monetize them," Lamar states. Lamar discovered Infusionsoft through an email newsletter that he subscribed to. Curious about what it could do for his own business, he spoke with an Infusionsoft expert to try to understand how Tyler New Media might leverage automation. As soon as he spoke with a rep, Lamar says, "I knew Infusionsoft would give us the back office systems we needed to begin capturing the large volume of traffic we were receiving on our blog and help us to turn those readers into customers." 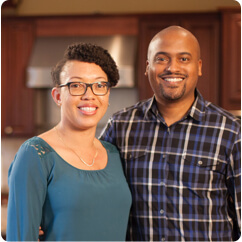 The Tylers began using Infusionsoft for email, customer service, and e-commerce capabilities. However, after attending a local user group and networking with other customers, they were inspired to leverage the full power of the software to set their business into hyperdrive. Tyler New Media's team partnered with a number of Infusionsoft certified consultants specializing in various aspects of sales and marketing automation, including Get U Wired, Success Engine, and fellow customer Jermaine Griggs. Once they were up and running with Infusionsoft, there was no stopping Tyler New Media. Their database swelled from 9,000 contacts to 117,000 (a 13-fold increase). Their Facebook page boasts 400,000 fans, and they are working with many of America's largest brands to amplify their message and reach more African American families across new channels. The business uses a number of innovate lead generation strategies, including what they have learned from fellow users in the Infusionsoft community. Partner Jermaine Griggs shared a particularly valuable strategy; videos are sent to leads more or less frequently, depending on how much the lead is viewing them—enabling the hottest leads to move through the sales funnel faster. High-touch, custom communications are enabled by the Infusionsoft platform's segmentation capabilities. Based on demographic information collected through survey responses and behavioral information that is automatically tracked with the software, contacts can be funneled into a specific campaign. When they are purchase-ready, prospects can receive order forms and complete payments through the Infusionsoft platform, eliminating the need for Tyler New Media to move between multiple systems. Because Infusionsoft provided tools to attract leads, sell, and "wow" leads—based on the Lifecycle Marketing framework—Tyler New Media has been able to grow more than just its email list. Revenue has multiplied 566%, without a corresponding increase in hours worked; in fact, while the Tylers are still busy with a 48-hour work week, they have reduced time spent on their business by 50%. Lamar explains that Infusionsoft "gave us the systems to begin capturing our readers so we could learn more about them, nurture them, turn them from readers into customers then wow them with our customer service." With six films under their belt, half a million fans, and 30 staff writers, Tyler New Media is fulfilling its mission to reach new African American families with an empowerment message every day. In Lamar's words,"Infusionsoft has allowed us to operate like a huge business to our readers and customers while only being run primarily by my wife and me over the years. It has stabilized our income and allowed my wife Ronnie to leave her full time job to fully join the business which has had a major impact on our home life."